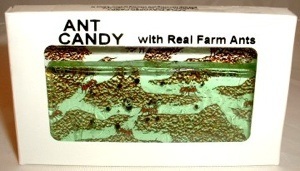 Made with real farm ants this hard candy by hotlix is a delight to try. The 2 pack of ant candy is a treat for all. Real ants have been included inside, and it looks like a colony has begun digging. It includes whole ants as well as misc ant body parts. Some say ants have a slight pepper taste when eating. Decide for yourself and send in a video of you eating your Hotlix Candy. The ant candy comes as a 2 pack in 2 flavors Green Apple, and Yummy Strawberry.